By day I work as a graphic designer, which means no talking and very little language-based thinking. The beauty of moving stuff around on Photoshop for 40 hours a week is that I am free to listen to stories without it impacting my work. The downside? A full-time job means I do not have time to sit down and read an actual book. That being said, I technically listened to each novel I am about to recommend, but I guarantee you the books hold up on paper as well as in audio. The stories are that good. This book centers around a scoutmaster and his troop during a camping trip in the Canadian wilderness. The group thinks they’re alone on an island when a stranger stumbles upon their camp and sets off a series of unexpected, horrific events that leave everyone scrambling to survive. If you hate the “body horror” genre then this tale is not for you. The Troop is like a cross between the Dreamcatcher toilet scene and a serial killer movie. It is gross as all hell, very descriptive, insanely well written, engaging from start to finish, made me sick to my stomach, had me pausing to clear my head, and more. I am a huge Michael McDowell fan. He wrote the screenplay for Tim Burton’s Beetlejuice, The Nightmare Before Christmas, various episodes for Tales from the Crypt, and more. Despite his impressive contributions to Hollywood, his novels are what ultimately drew me to him. McDowell wrote phenomenal Southern Gothics—and The Elementals may be my favorite. This story is about two families, a summer vacation, and three beach houses on the Alabama coast. Two homes are livable, while the third is slowly becoming a sand dune. Despite this, the house is still inhabited. Something terrifying resides in it, though no one can really remember what or why. There are deaths, spooky histories, unnerving shadows, mysterious sounds, and descriptions that are so perfectly penned you can see the image when you close your eyes. Give this book a shot. This book is an homage to the film that started America's zombie fascination—George A. Romero’s Night of the Living Dead. There are stories from more than 20 authors in this collection, including Jonathon Maberry and Romero himself. It is interesting to see how author’s approach the now-classic, at times over-hyped, subject of zombies. Rather than falling into cliches, each other in this compilation puts a unique twist on the zombie apocalypse. There are shorts about a sister-brother street racing gang, a psychic government agent, a chaotic zoo, a woman plotting to murder her husband for insurance money, a lonely scientist, and more, just with some living dead thrown in the mix. My personal favorite tale was "Jimmy Jay Baxter’s Last, Best Day on Earth" by John Skipp. It is about a white supremacist and I laughed from beginning to end. (Also I highly recommend the audio version as it has a full cast rather than one voice actor). A physicist, a spiritualist, a mental medium, and an actress walk into a haunted house and…well a lot of scary stuff happens to them and there’s no comedic punchline. Sorry to disappoint. Basically, a wealthy benefactor paid for four strangers to gather and determine what happened in the Balasco House—aka “Hell House.” The home has not been touched in over 20 years and has more lore and mystery than it does unbroken panes of glass. All previous attempts to solve it’s mysteries has led to suicide, insanity, and murder, and it doesn’t look like this investigation will be much different. If you like haunted houses, ghosts, and tension over gore, then this is the book for you. It touches on all things spooky and then some. Burnt Offerings is a horror classic for good reason. The book was a major influence on Stephen King’s The Shining, inspired a (horribly lame) film of the same title, and seems to be on everyone’s “Top 20 Best Horror Books” list. As for me, I do not believe I have ever read a haunted house novel so suspenseful, twisted, and oddly succinct. Marasco wastes not a single word as he weaves a terrifying tale of a family seeking a summer reprieve from New York City. If you only read one book from this list, I highly recommend it be Burnt Offerings. And that’s what I have for you! Let me know if you read any of these books, I’d love to hear you take on them. What about you? 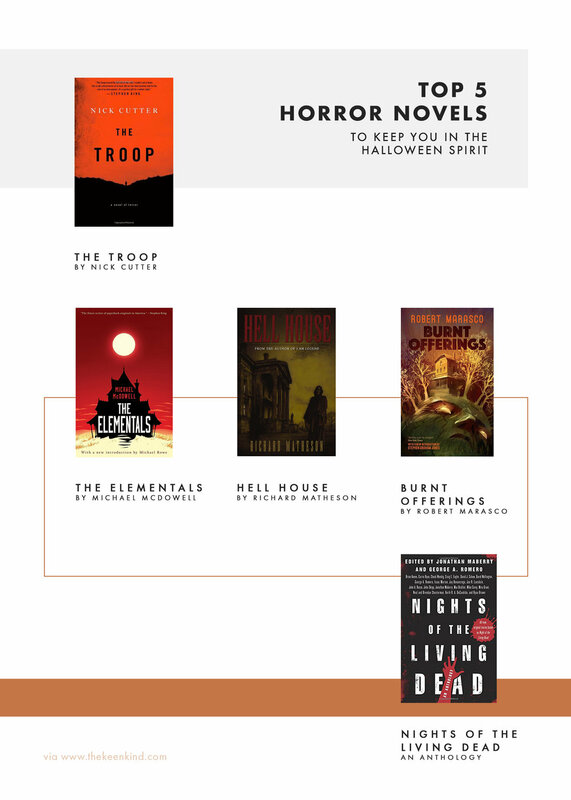 Do you have any favorite horror novels for this spooky season?